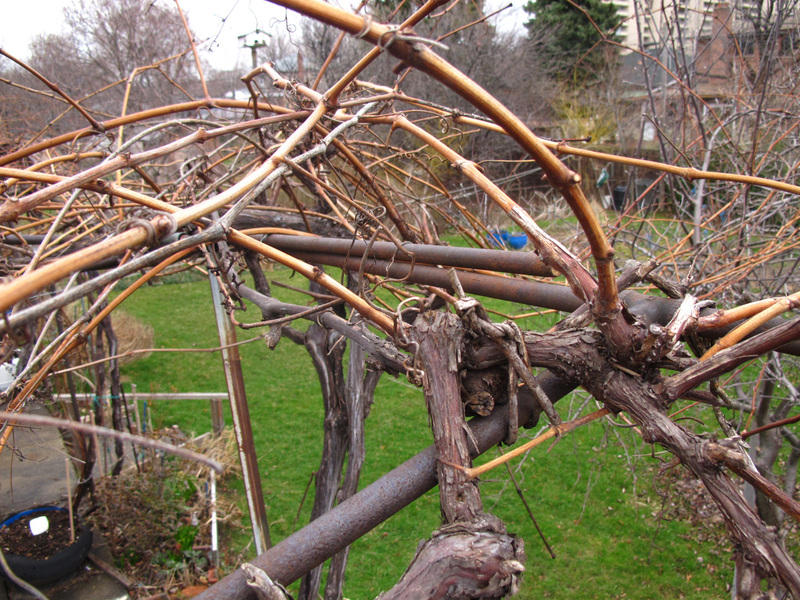 With each snip of the pruning shears, a branch of the grapevine falls from the pergola to the ground, followed moments later by droplets of sap. Like tears, they swell and expand until their weight makes them plummet from the cut stems, sometimes falling on my cheeks or forehead. I trim hurriedly and with resolve, as if I had a schedule to keep. Against the dull gray sky, the vine is a web of infinitely random shapes. Perched on top of the aluminum stepladder, I am barely able to poke my head through the snare of spidery branches, and can see only a thick, impenetrable canopy of braids, twists and knots. If they were sounds instead of twigs, they would constitute a cacophony, so tangled and messy they are, beyond redemption. It is a privileged view, reserved for the birds that fly overhead or alight on the arbour to rest. The discoloured, galvanized steel pipes that form the structure are attached to the brick wall of the old house. I marvel at how the vines have deftly reached beyond the rusty pipes to climb the bricks, how their thin runners have penetrated the aluminum soffit through the vent holes so that the stems can grow over the eaves troughs. They have resolutely squeezed themselves in between the shingles and wood boards of the roof, making the old home theirs, just like the immigrants who planted similar vines have made this city theirs. The vine’s runners are like sensitive tentacles that can sense and locate the slightest crevice or hook, around which they coil themselves, tethering the mother plant. I, too, feel somewhat tethered to the arbour, and tighten my grip on one of the rusty steel pipes, lest I should fall from the wobbly ladder. One of its legs is slightly bent, and a ladder with uneven legs is impossible to make stand firmly. In his time, my father would have said that the ladder was “false”. Be careful, it may trick you and make you fall, he would have cautioned. In moments like these it is easy to think of your father. In moments like this, with only an empty sky for company, you could almost become your father. I take pleasure in the solitude of the moment. I take even greater pleasure in the way that he was able to transform discarded pipes, assorted pieces of rebar, aluminum and other metals into this improbable architecture, and in the intricate joints that he devised in order to connect pipes of different caliber. How immensely clever it was of the old immigrant to use “found” materials long before the expression itself had found currency in popular language. Father’s pergola is the arbour of an immigrant worker, fashioned with whatever supplies he had and whatever skills he could muster at the time of its creation. The sap that pours out of each twig is copious given the lateness of the season. The branches are bursting with liquid waiting to spill out. My cutting becomes less hurried, more rhythmic and contemplative. Dark blobs of wetness soon appear on the patio floor, appropriately enough made from slabs of cement recycled from a nearby house. Only one year ago I would have approached the task with much less confidence, anxious about doing it right. But now that Mother is dead and he, infirm and housebound, I can give myself some free rein. Is this the impudence of the child replacing the gratefulness of the parent? The grapevine is my witness. I remember how Father used to say that an immigrant truly belongs to his adopted country once a family member lies buried in its soil. Instinctively, I isolate individual branches and mark them for my shears. 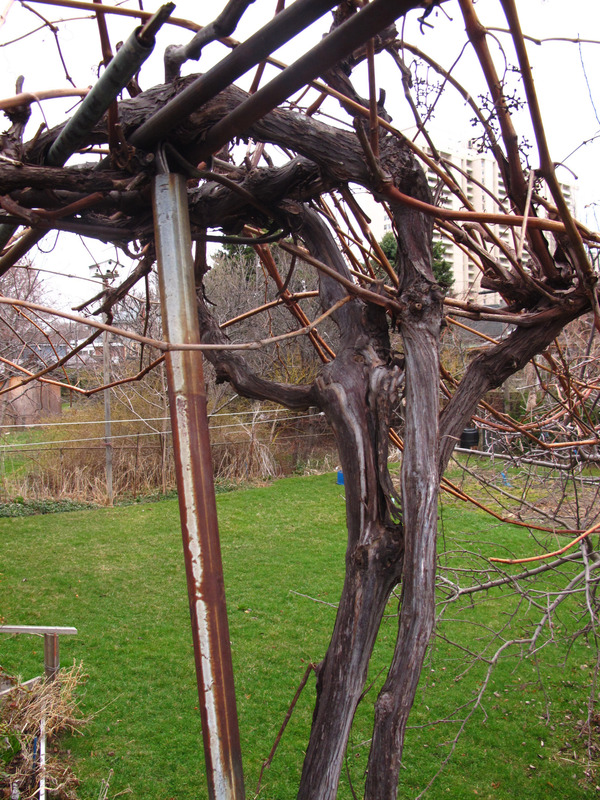 The secret about pruning a grapevine, Father told me every season, is this: fammi povera e ti faccio ricco. Make me poor and I’ll make you rich. Cut me down and I’ll rise up again: with an abundant harvest. But my pruning is not intended to maximize yield at harvest time for I surmise that raccoons will eat or destroy most of the fruit anyway. There has been an explosion of the rodent population in the city of late and the animals, completely urbanized and fearless, routinely wreak havoc on the backyard gardens of Toronto. 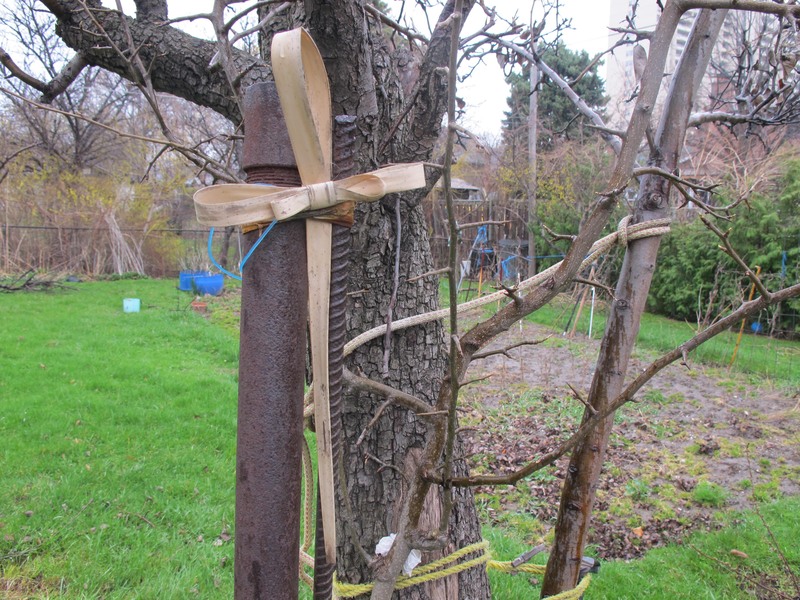 My pruning has to do more with finding comfort after a death in the family, with the need for the constancy of home life, or perhaps with the need for ritual and the inescapable fact that finding home is a ceaseless quest. The gnarled stems easily betray a half-century of life. Twisted and bent they cling to the tarnished metal rods and steel pipes like a veil of memories. The craggy bark peels off in shards and layers at the slightest touch and today nothing looks sadder than the contorted stems of an old grapevine in the period between winter and spring. Weathered and frail like the octogenarian who planted them, the great stems hold a secret: within them lies a witness of robust lives lived. If they could, they would surely speak of the bountiful harvest of ’77 —or was it in ’87?— when the vines yielded fourteen memorable bushels of glistening white and velvety purple grapes. The perfume of Concord labrusca hung heavily in the air, the way that thick molasses ooze out of a barrel. Then there was the laughter of children rising from under the shade of the plants every season. And just as assuredly, the vines would speak of the births and deaths that were commemorated with wine made from their fruit in the annual ritual in the basement. I continue to trim and cut relentlessly and transport myself back and forth from my perch to other solitudes as the grapevine anoints me yet again with its sweet sap of spring. It feels like a homecoming and I am briefly overtaken by sentiment. I let it sweep over me, forgiving the indulgence. Doing yard work at your parents house is a very different experience than doing yard work at you own. I really enjoyed the reflection. 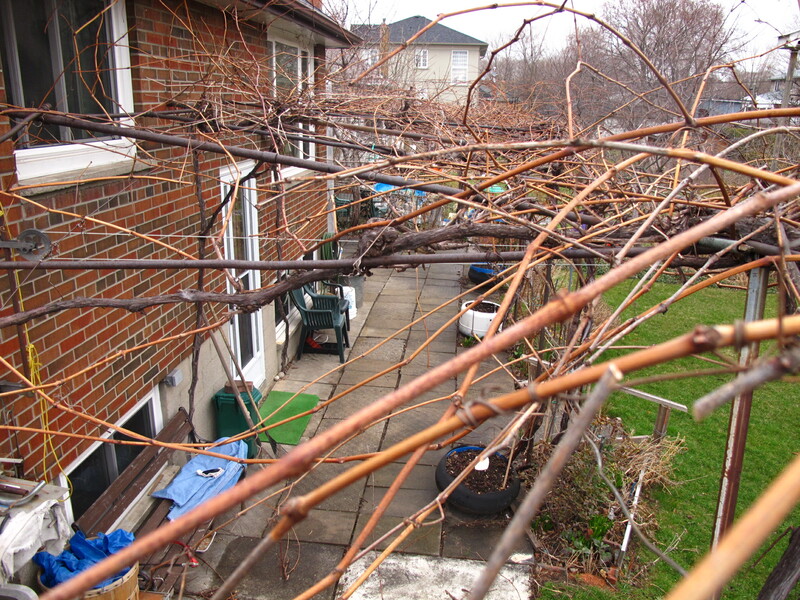 Tags: death in an immigrant family, fathers and sons, immigrant builders, makeshift pergola, missing father, nostalgia, pruning grapevines, Toronto wine-making. Bookmark the permalink.